Jet setting to the sun ? Planning a shopping spree abroad ? Then you need our jet lag cure ! 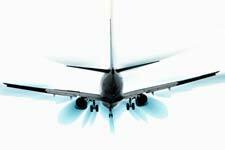 To understand Jet Lag we need to look at bird migration. Birds are born in a particular place at a particular solar time of the year. This magnetic information is structured into their brains like programming a computer with SATNAV. They instinctively know where to return to – they “go (and return) with the flow”. We humans have had our cohesive magnetic brain ability greatly reduced over time. Jet Lag disorientates our magnetic status quo and our brains become disorientated and parted from the idea of “home place”. In order to bring our brains back into magnetic polarity during the disruption of rapid space-time change i.e. international flight, we need a device to balance our left-brain - right-brain polarity - negative and positive. This is done by the correct choice and combination of 8 particular natural gemstones that due to their inherent atomic symmetry and polarity recreate that balance, before, during and after any journey. The Spiral of Tranquility™ “Pendant” has been created for this purpose. See www.lessstress.ie for further product info. The Spiral of Tranquility™ “Pendant” - Jet Lag Solution. Approx dimensions: 33 x 5mm. Approx weight: 11gms. Jet lag is a physical condition, which is a consequence of alterations to the circadian rhythm (internal body clock regulator of biological functions). These type of alterations can be as a result of altered day/night length as experienced with international travel especially when one crosses more than one time zone. This can contribute to fatigue, disorientation, irrationality and lower resistance to disease or illness. Symptoms of jet lag include severe fatigue for days after arriving, generally accompanied by a lack of concentration and motivation, especially for any activity that requires effort or skill, such as driving, reading or discussing a business deal. Dehydration can cause headaches, dry skin and nasal irritation and make you more susceptible to any colds, coughs, sore throats and flu that you may encounter during your travels. Some people can experience swelling of limbs. Jet lag disorientates our magnetic stability and can also be exaggerated by environmental factors such as radiation from manmade or natural sources. The condition of Jet Lag can last many days and recovery is typically one day per time zone crossed but this can vary depending on your state of health and fitness and consequently is individually determined. - Jet lag can be exasperated by your preflight health condition, poor air-condition during flights, dehydration, poor quality food and drink, lack of exercise and excessive alcohol. A recent New Zealand study showed 96% of flight attendants suffer from Jet Lag. 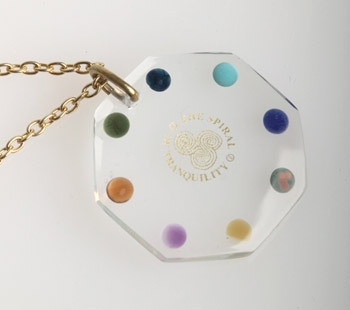 “Being someone who travels a quarter of a million miles a year, I delight in the help the Spiral of Tranquility™ Pendant gives me while I am traveling. I highly recommend it to anyone”. “I have recently returned from a trip to Australia to visit my daughter and family. I felt that I must write to say how effective I found the Spiral of Tranquility™ “Pendant” during and after all the travelling. I wore the “Pendant” on a chain round my neck for the whole journey and found myself much more relaxed during the long flight (22 hours!) and I did not suffer from the dreaded jet lag at all neither upon my arrival nor my return home. Whilst in Australia, my daughter and I took part in a horse event and, to get there, had to drive, towing the horse trailer, for several hours on dirt roads in a terrific thunderstorm. I remained pretty unflappable throughout, causing my daughter to remark “can’t think why you are so calm, Mum”. I honestly think that it may have been due to the fact that I was again wearing the “Pendant” round my neck. This is actually the second time that I have worn the “Pendant” on a flight to Australia. The first was 6 years ago. That time, I wore it only for the actual flights and again did not suffer from jet-lag. This later trip does, I think, prove that the effect is genuine. This website is brought to you by the Spiral of Tranquility™ (Galway). We are dedicated to educating the public about health risks associated with modern life. We also sell a range of innovative products that help to allay these risks direct from our main website: www.lessstress.ie. 9 Carragh Hill, Knocknacarra, Galway, Ireland.